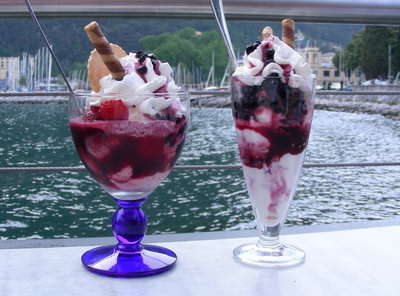 LAKE GARDA Newsletter - Ice Cream Italian-style! Well, we're full swing into summer now! It may get hot here in England for a day or two, but July and August are known for being the hottest months, usually consistantly, at Lake Garda. Traditionally a lot of Italian workplaces close during August, so many Italians have the whole month off! So that, coupled with the large amount of tourists there on holiday in August, makes it a very busy month too! But the atmosphere in the summertime there is fantastic! Everyone eats outside and listens to the live bands and watches the artists along the promonades. And throughout the hot day and into the evening, you'll notice a lot of people eating ice cream to cool off! And that's what we're going to talk about this month: the delicious ice cream there!! Italian ice cream...what can I say except that it is something we indulge in every day when we're there in the summer, because it is just so good! There are so many different types here, not only flavours but styles too. It's easy to see why the Italians are world famous for their ice cream. There is nothing better than to get stuck into one of the massive glasses of ice cream whilst sitting by the lake on a hot day. And it really does get hot there; take a look at our weather chart to check out the weather for this time of the year. 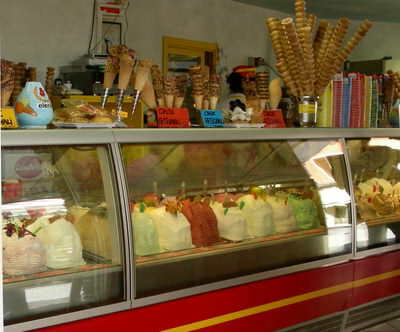 If you've not been to Lake Garda before, one thing that will amaze you is the sheer number of ice cream shops here. They are everywhere and you always get a massive selection to choose from. The ice cream shops just tend to sell ice creams in different sized cones or tubs, whereas cafes and restaurants do loads of fancy, often huge, ice cream dishes which are gorgeous! And by the way you'll also see tons of cafes everywhere too, you can find out about the coffee in Italy on our coffee page. But let's get back to the Ice Cream - on a roasting day it's something I crave much more than coffee anyway! 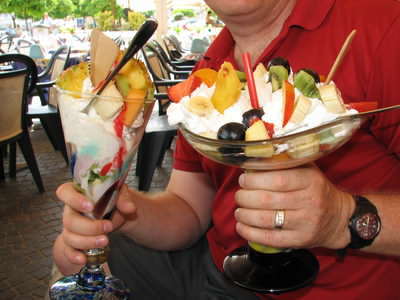 These wonderful ice cream dishes, usually served in huge glasses, are a real work of art and taste absolutely stunning! You can choose from loads of different fresh fruit concoctions and whether you want one with tons of fresh cream or just ice cream. I have yet to try one that I didn't really love. They all taste heavenly! It is normal here to have a choice of 30 or 40 different flavours! There is every type of fruit flavour you can imagine, chocolate combos and much more. When we get a cone or tub we often ask for 2 or 3 different flavours and try out some new ones. One of my personal favourites is the Coconut Ice Cream, I highly recommend it. So, forget the diet while you're there (after all you're on holiday right? ); you simply have to get stuck into some unbelievably tasty and refreshing Lake Garda ice cream! The ice cream isn't the only thing that'll get your tastebuds going...there's lots of lovely Italian food at Lake Garda to try out too! Here are the main events going on in the Lake Garda area this month. There are also loads of smaller things happening in each town everyday, from art exhibitions to sporting events. Please contact us if you want to know what's going on in any particular town during this month and we'll do our best to help you. The opera season in the Arena, organized by the Arena di Verona Foundation, brings over half a million people to Verona every year and over fifteen thousand spectators flow into the amphitheatre every evening of the season: a truly cosmopolitan audience, with people from both inside and outside Europe. The young and the old are invited to a night of fairytales! The nights of fairytales in Riva del Garda have become quite a tradition. They are organized annually with a different motto. For the “Notte di Fiaba 2010” it will be "Treasure Island". There are, of course, all the usual markets that are definitely worth going to. To find out more about when and where they are, click here. Every month we research and then feature a hotel or apartment at Lake Garda to give you an idea of the accommodation there. We always make sure the hotel has a guest rating of 8 or more (out of 10), so you know it's a decent place to stay! 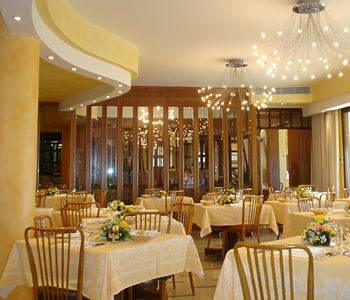 Europa Hotel is a welcoming property overlooking the lake. 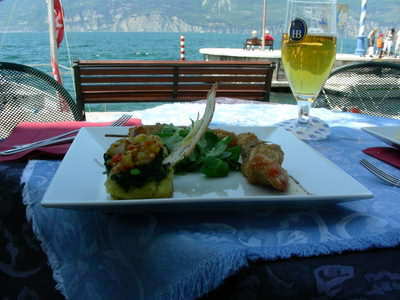 It's conveniently located in Desenzano del Garda, on the south of Lake Garda. Within easy reach of the town centre, the hotel is indeed an ideal base from which to discover the picturesque landscape of the lake as well as the charming small towns spread throughout the area. Hotel Europa offers well appointed accommodation, a fine restaurant, a cosy bar, a TV room, an Internet Point, meeting facilities, magnificent views over the lake and friendly, attentive service. Take a look at the photo and click on the link below to see loads more info & photos! 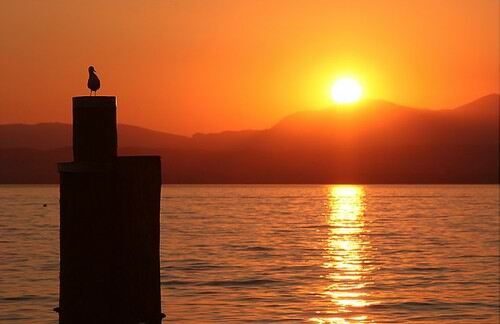 We really want to hear about your Lake Garda experiences and stories, even if it's just a sentence or two. Get your story in a future newsletter and share your experiences with others! Whether you want to share your favourite hotel, town, family outing, or sport you've experienced at Lake Garda, we'd love to hear all about it. We hope that you are now desperate to try some Italian ice cream when you're there! It really is the best ice cream in the world and we know you'll love it as much as we do. Enjoy, and see you next month!